WHEN YOU ASK GALLERIST DOUGLAS REYNOLDS AND ARTIST DON YEOMANS how they met, you get two versions of the same story; they highlight different things. That’s just how memory and storytelling work. And both of these men are storytellers. Doug is the owner of Douglas Reynolds Gallery on Granville Street. He’s a quick wit and quick to laugh, ready to talk to anyone and share his passions. In subtle contrast, Don is quiet and thoughtful, yet equally quick-witted in a wry-humour sort of way. When Doug mentions that Don designed the metal gate at the entrance of the gallery, Don jokes, “It turns into a prison at night.” “A friendly prison,” quips back Doug. Today, Don drove in from the Valley to drop off a new panel for the gallerist. Sitting in Doug’s office, we discuss how two met before getting to know more about this year’s Splash contribution. Classical music drifts in from the gallery, where visitors can see an impressive array of Northwest Coast Native Art. Doug got his first gallery job in the late 80s. He met some of the exhibiting artists, including Don Yeomans, and started spending time with them. 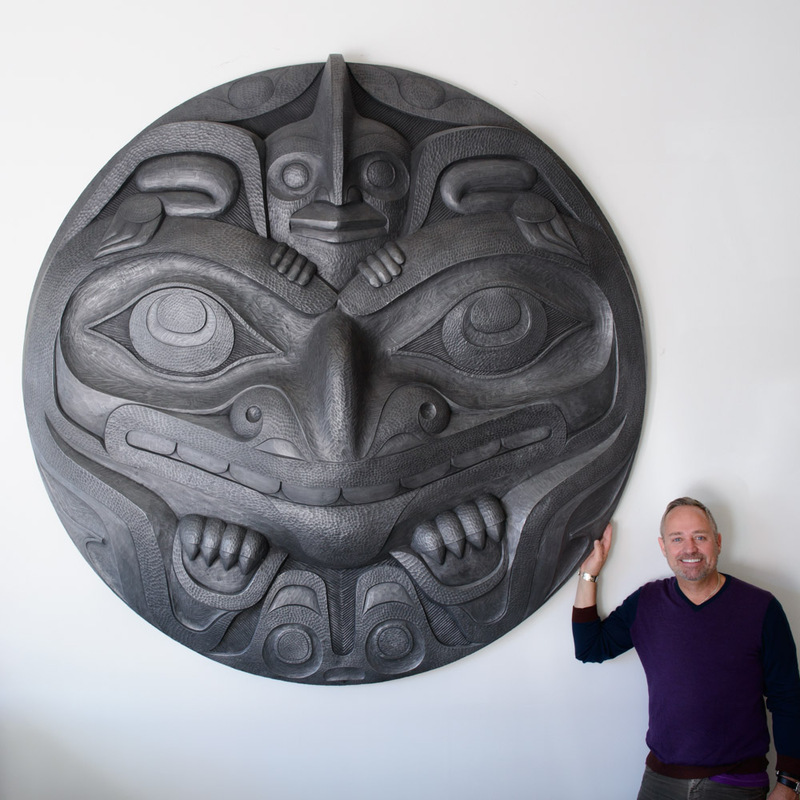 Over five years, Doug picked up more and more knowledge of contemporary Northwest Coast art, and then he worked at a non-profit for two years before opening Douglas Reynolds Gallery in 1995. After working a year in galleries, Doug realized something: he was enjoying his work. So he stuck with it. 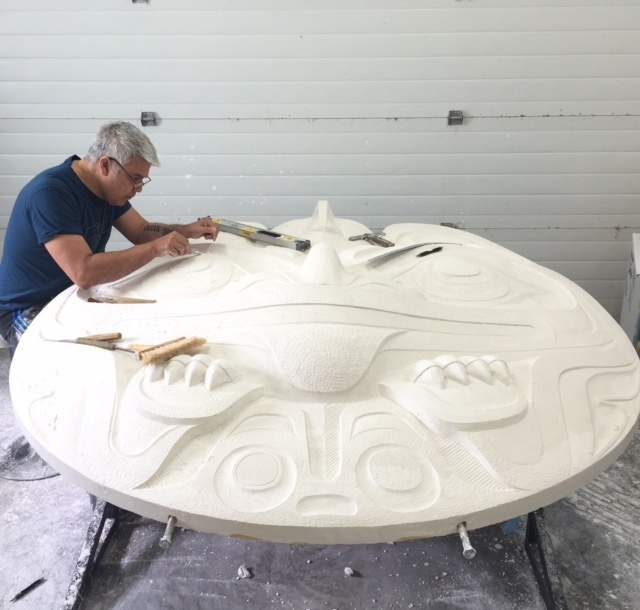 While Doug admits he knew little about First Nations art when he started, exposure to the art and relationship-building with the artists allowed his knowledge to grow organically. He was friends with Bill Reid’s niece; later, Bill became Doug’s landlord; through Bill, Doug met a lot of other carvers. “With Bill came Jim Hart, and with Jim came Don Yeomans and all the Haida who worked on the big canoe sculpture at the airport,” says Doug. 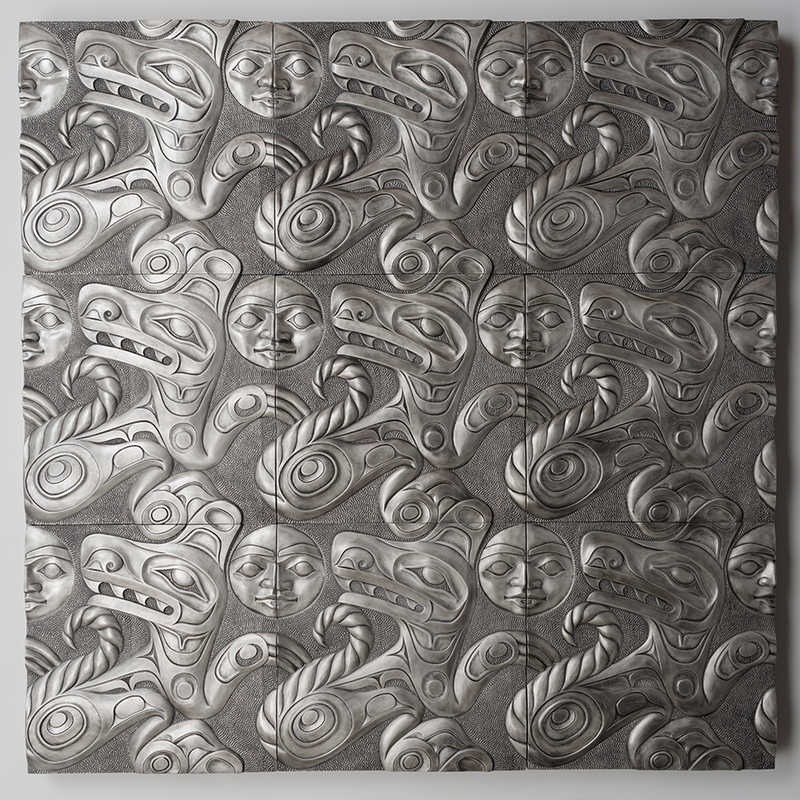 The set of nine panels feature a pattern of wolves and moons. “I don’t do [wolves] very often,” says Don, “but when I depict them, I don’t ever see them as singular animals.” Instead, he views the wolves as a unit, a family, a pack. Don says his ideas come from observation. “When I was starting out, I took a lot of my ideas from looking at beginner’s work,” he says. “That’s where the creativity is.” Beginners often just don’t have the knowledge of the technology or an understanding of materials. But beginners can be just as creative as the master.